We are taking over a new company and nobody knows the administrator password to log on the Windows Server 2008 domain controller, we try with few users to see if they were administrator in the domain with no luck. no way to contact the person that set it up. Is there a way that we can change or reset the password? Thanks in advance. I think it is a fairly common occurrence these days that IT Administrators forget the password of a domain controller after they have got back from a vacation or there has just been a situation where the previous system admin has left without leaving the server password. There are lot of different Windows password recovery utilities that are available on the web. Some open source and some paid ones and it can get a bit confusing when deciding which one to go with. There is one utility that you can rely on and believe it works on all Windows Server OS, including Windows Server 2012/2008/2003/2000. This is called Reset Windows Password. Once you have downloaded the ISO image, burn it on a CD and then boot the server of it. Resetting forgotten domain administrator password for a domain controller is a 2-step procedure. How to Reset Forgotten Domain Administrator Password on Windows Server 2008? First, you will need to download the Reset Windows Password utility on any PC that you can access. This can be your work PC, or a friend or your co-worker’s computer. After the download is complete, unzip the download file and you’ll get the ResetWindowsPwd.iso file. Burn the ResetWindowsPwd.iso file to a CD using your preferred CD Burning software. If you don’t have one, you can use the freeware such as ImgBurn or ISO2Disc. If your domain controller doesn’t come with a CD/DVD-ROM, you can choose to burn the ISO image to a USB flash drive using ISO2Disc. Put the CD into the CD drive of your domain controller, then change the boot order in BIOS to set the computer to boot from CD. Once the computer has booted, it will load the OS inside the CD drive and launch the Reset Windows Password utility. Choose the Reset Active Directory Password option, the program will locate the ntds.dit file which is used to stored domain user login details on your domain controller. Choose the domain administrator account and then click on Reset Password button, the program will change the forgotten/unknown password to Password123 by default, and also unlock/enable the account in case it is locked out or disabled. The last step is remove the CD and restart the domain controller, you’ll be able to log in to your Windows Server 2008 using the domain administrator account. This is it!! You have successfully hacked your own server. Backing up Active Directory is essential to maintain an Active Directory database. A system state backup is particularly important for disaster recovery purpose in case of a accidental corruption or deletion of Active Directory objects. Since Windows Server 2008, you won’t find the well-known ntbackup.exe, the native backup tool in previous Windows versions. Instead, you use Windows Server Backup, the new native backup solution, which is available as an installation option in all versions of Server 2008. Tips: If you forgot domain administrator password in Active Directory and can’t log on the domain controller, you can reset/unlock any domain user account passwords easily with Reset Windows Password utility. In this tutorial we’re going to demonstrate the steps of backing up Windows Server 2008 Active Directory. To get started, you need to install Windows Server Backup from the Server Manager, so you can then use it to perform a system state backup. Go to Start menu, and then select Administrative Tools, click on Server Manger. 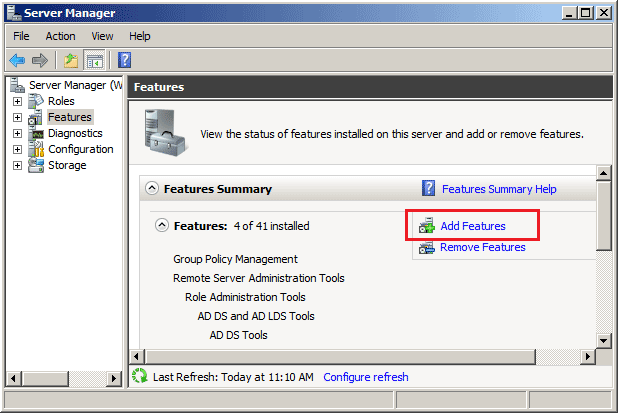 Under Server Manager window, click on the Add Features link from the features summary section. 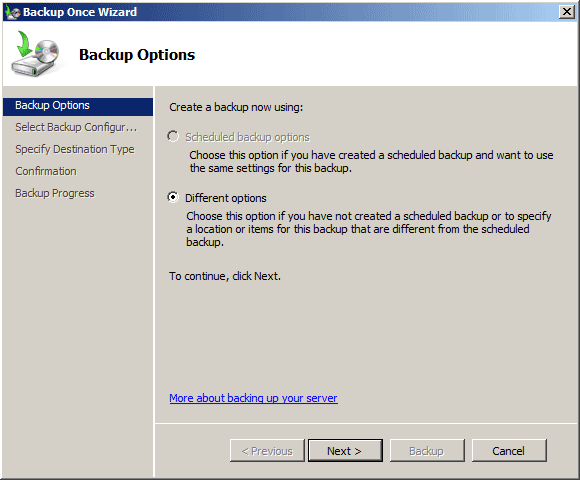 Select the Windows Server Backup Features, and then click on Next. The Command-line Tools allows you to perform a DC backup and recovery from the command line. Click on Install to complete the installation. Now that we have Windows Server Backup installed lets perform our first backup of Active Directory in Windows Server 2008. 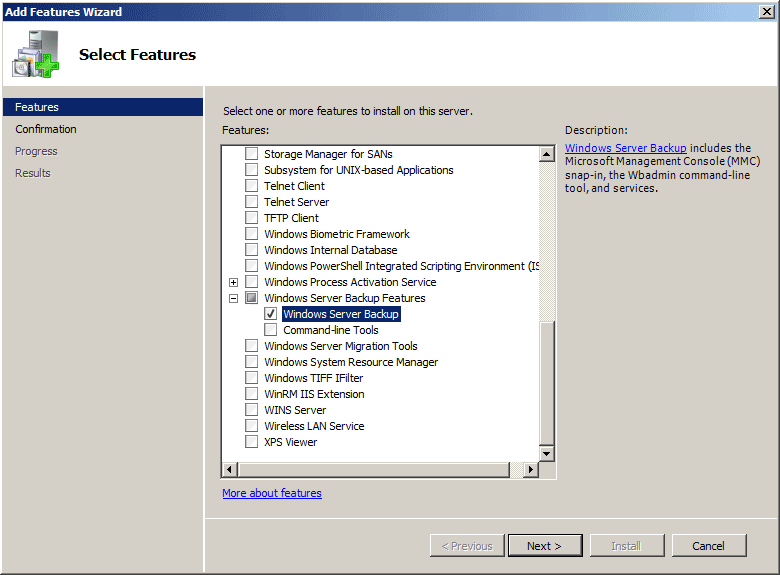 Go to Start menu, and then select Administrative Tools, click on Windows Server Backup. 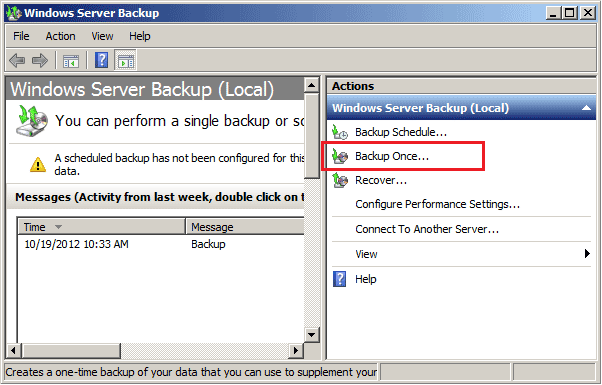 Select the Backup Once option to perform an immediate backup as illustrated in the screen below. 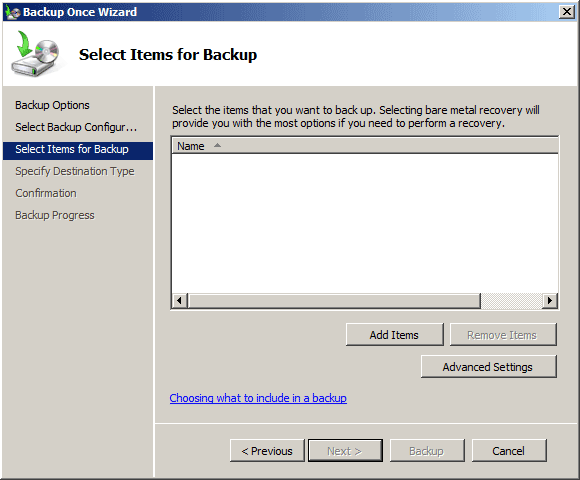 It will bring up the Backup Once Wizard, select Different Options and then click Next. 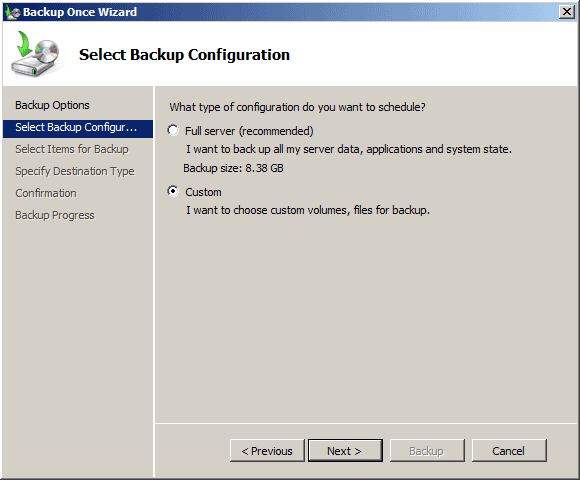 If you want to perform a full backup of your server, click on the Full server option. Now we’re going to perform a system state backup, so we choose the Custom option. In the next window, you can customize the items you want to backup. Click on Add Items button, check the System state option from the list. You can also choose to backup the entire NTFS volume on your computer. 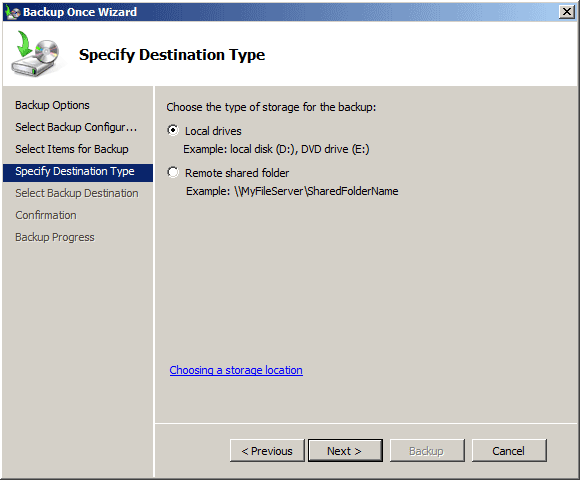 Specify the destination type for your backup. 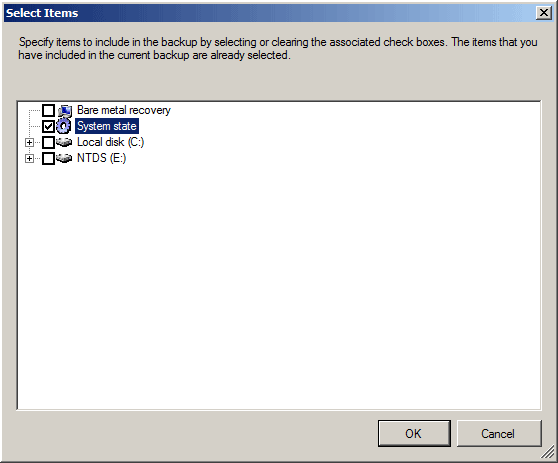 A system-state backup can’t be performed directly to a network share so we have to choose the Local drives. Next select a volume to store the backup. 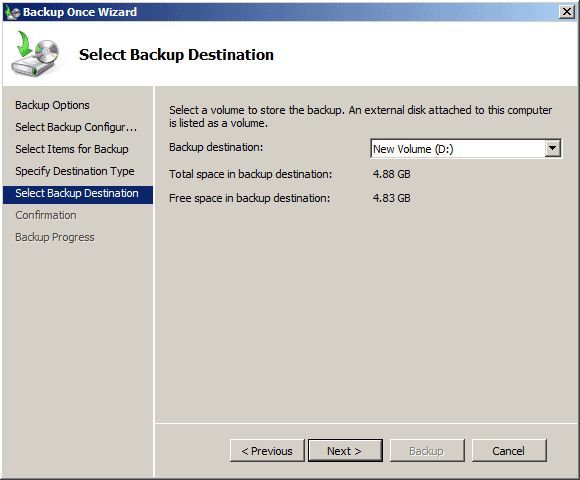 Windows Server Backup requires you to provide a separate target volume for the backup data. In single-volume server, you may need to shrink the existing partition to create a volume dedicated solely to backup data. 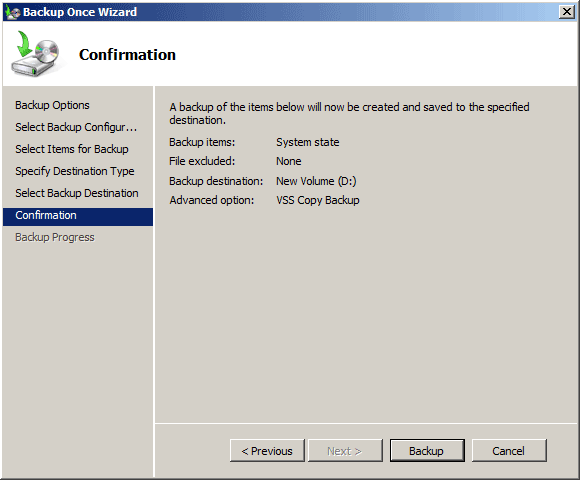 In the next window, confirm the options you have selected and then click on Backup. If you want to script the backup process, or if you are backing up a server on a Server Core installation, you can use the WBADMIN.EXE command-line program. WBADMIN provides a complete set of options that perform essentially the same functions as the MMC snap-in, including performing a system state backup. We have a few customers, who have forgot their AD Administrator password on their Windows 2008 server. Is there really any way to recover it? I know it’s possible to reset your Windows 7, XP and Vista password. But is it possible to get the AD administrator password on a 2008 server? I hope we can avoid a re-install. Cheers. Lost or forgot the administrator password on Active Directory 2008? There isn’t any efficient way to recover the password as Active Directory encrypts the password using some very strong encryption algorithms. But you can reset or replace the forgotten password easily. Today’s tutorial will be covering a technique that will allow you to reset your lost 2008 Active Directory Administrator Password. How to Reset Lost 2008 Active Directory Admin Password? After you have the Live CD, put it into the CD drive of your Active Directory server whose password you want to reset. Turn on the Active Directory server and have it boot from the Live CD. You may need to go into BIOS and set CD/DVD as the first boot device. Choose the administrator account from the list, then click on Reset Password button, the program will replace the forgotten/unknown administrator password with a new password: Password123. Take out the Live CD and reboot the Windows 2008 server, you can then log in to your domain administrator account with your new password. With the Live CD you can also reset lost admin password on Windows 8, 7, Vista, XP. In any small network setup where there are maximum of 15 computers, peer-to-peer network infrastructure is the best solution. However when the number of computers are increased and it becomes practically impossible for the administrators to manage several computers as a peer-to-peer setup, installation of Active Directory Services becomes essential. Let’s start by installing Active Directory through Server Manager. This is the most straight forward way, as a wizard will guide you through the steps necessary. 6. The Confirm Installation Selections screen will show you some information messages and warn that the server may need to be restarted after installation. Review the information and then click Install. 7. The Installation Results screen will hopefully show Installation Succeeded, and an additional warning about running dcpromo.exe (I think they really want us to run dcpromo). Click Close. 11. The next screen warns about some operating system compatibility with some older clients. Click Next. If you plan on creating more domain controllers with the same settings hit the Export settings … button to save off a text copy of the settings to use in an answer file for a scripted install. After exporting and reviewing settings click on Next. When its done you will be notified and required to reboot your PC. That’s all! Now you have a working installation of Active Directory. How to Add a Computer to Windows Server 2008 Active Directory Domain? This post is for newbies, for the people who are learning Windows Server and Active Directory administration. Follow below steps for adding a computer or a member server to Windows Server 2008 Active Directory based domain. Go to Run and type ‘NCPA.CPL’ and launch Network settings. Configure IP address, Subnet Mask, Gateway IP (if any) and DNS IP address. Ensure connectivity by pining to DNS server / Domain Controller. Right click on ‘Computer’ and click on properties. Click on ‘Change Settings’. Click on ‘Change’ button at System Properties. Select ‘Domain’ and provide domain name. In this example its ‘training’. Click OK and provide user name and password of Domain Admin or any other authorized user name. Reboot the computer to enable the changes. If your are getting any errors while adding the computer to domain, there seems to be connection issues with Domain Controller. Go to the AD server and check if it is functioning properly. Also check the DNS IP configuration at the client computer. It should be pointing to the correct AD / DNS server. If you forgot domain administrator password for your Windows Server 2008 Active Directory, you can easily reset the password using Password Recovery Bundle 2012.